MÜZE is a collection of handmade, one-of-a-kind pieces of wearable artwork. 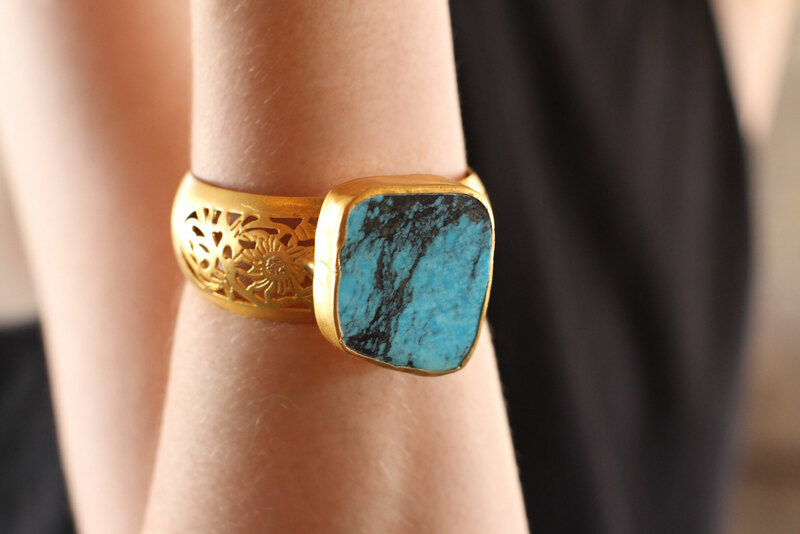 To make these totally unique pieces, we select the highest quality hand-selected raw turquoise from Kingman, Arizona. The stones are then turned over to our artisans in Istanbul, Turkey where they are combined with intricate metal work and old-world symbolism only traditional craftsmanship can offer. 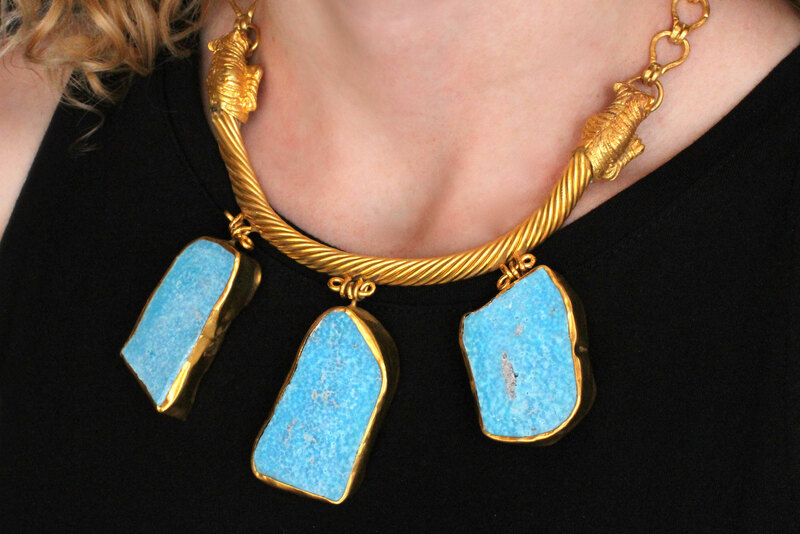 Each piece highlights the beauty of raw turquoise by preserving each stones natural features. The result is a meaningful piece of incomparable beauty that you can call all your own. The tiger, a fierce ruler of the jungle, embodies power and energy. Tigers are driven by instinct, allowing them to live freely and unpredictably. 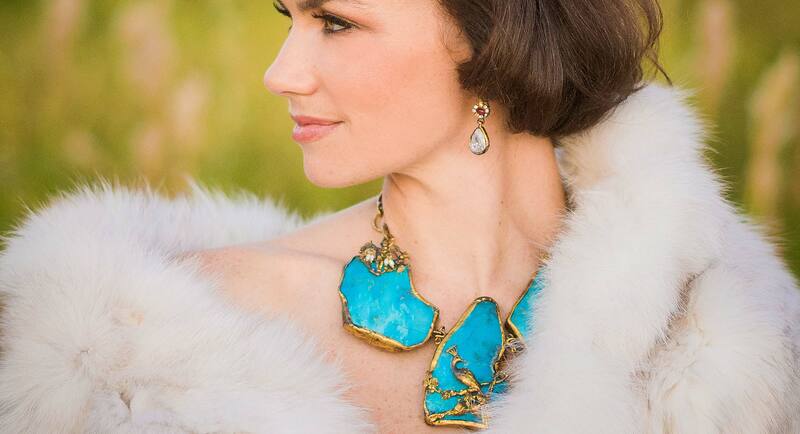 As accents to this breathtaking necklace, tigers serve as reminders to trust one’s innate vitality and courage. This one-of-a-kind piece will inspire you to believe in your own personal strength. The Moment of Clarity bracelet features a turquoise centerpiece on a gold-plated brass cuff with floral filigree details. Turquoise is believed to facilitate open communication and clarity of thought, blending the tranquility of blue and the balance of green. With turquoise as the focal point, this bracelet will stimulate your ability to focus inward and recharge your spirit during times of mental stress. This bold one-of-a-kind piece conveys an artful display of strength and elegance. 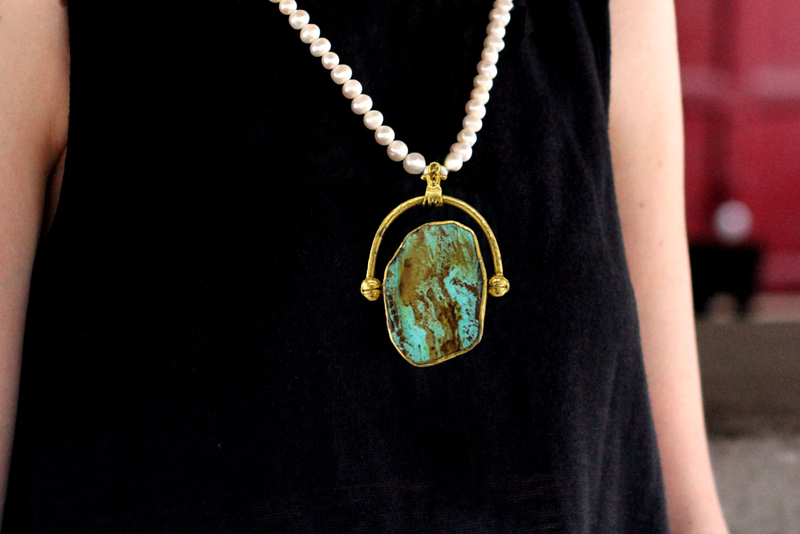 The central turquoise pendant comes alive with a matrix of brown veins. The pendant is set opposite a filigree cross pattée emblem, which may be displayed with the reversible setting. Held aloft by a string of tea-stained freshwater pearls, this unique piece combines the tradition of medieval heraldry with timeless beauty. 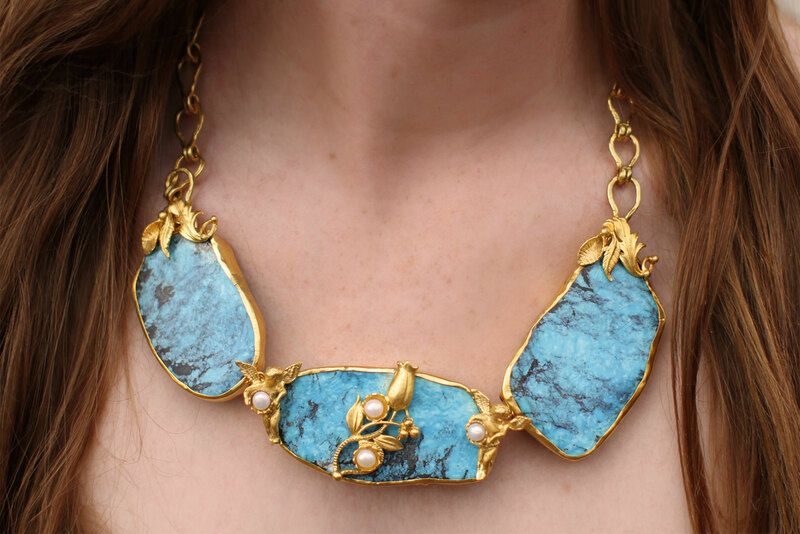 The Garden of Beauty Necklace is an aesthetic and artful piece made with deep, rich turquoise stones. At the center, this necklace features small cherubs attending to a thriving tulip, blooming against a lush turquoise garden. Inspired by the perfect beauty of nature, which the tulip traditionally represents, this necklace brings a life abounding in beauty to anyone who may wear it.